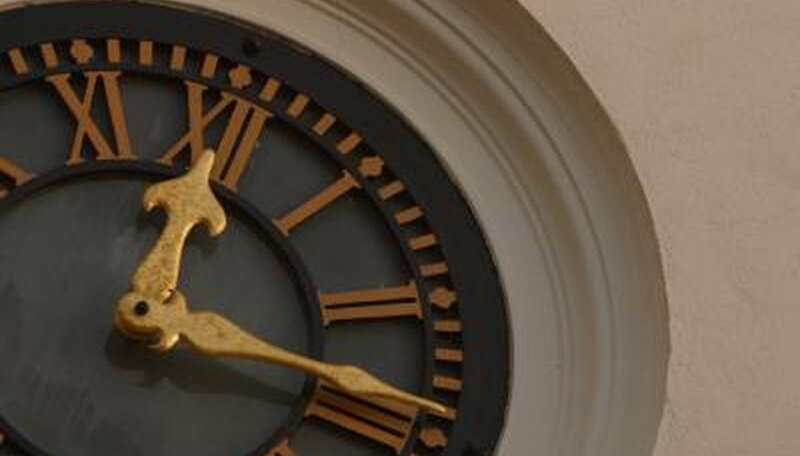 The hands of a clock are one of the most elegant elements of any clock design. Bend them while trying to take them off a clock and you decrease the value of the clock. Bend them and accidentally scratch the face of the clock and you've decreased the value even more. Clock hands are held to the clock in one of three basic ways. Each way requires a different method of removing the hands. Look closely at the arbor of your clock on which the minute and hour hands are mounted. Use a magnifying glass to see if a metal pin is passing through the arbor, parallel to the clock face. If you see one, your clock hands are held by a pin and collet. Take a pair of needle nose pliers and pull out the pin. The pin should be tapered, so pull from the fatter end. Lift off the minute hand, then the collet. Next lift off the hour hand. On some clocks the hour hand will have a small clip or screw holding it in place, which you will need to simply remove. Look for a metal nut with a serrated edge screwed onto the minute hand. If you find one, your clock's hands are held with a threaded hand nut. Undo the hand nut by holding the minute hand as closely to the nut as possible to prevent it from accidentally bending. Unscrew the hand nut with your free hand and lift off the minute hand, followed by the hour hand. Note that some clocks have a slotted nut instead of a hand nut, which requires a special tool. Look at the arbor of the clock for a pin or hand nut. If neither are present, the clock hands are being held on by friction alone. Grip the minute hand at the arbor and carefully pull it off. Grip the hour hand and pull it off. Never try to pry friction fit clock hands off with a screwdriver as they may get damaged or the face of the clock could get scratched.